"A combination of eggplant, mushrooms, and wild rice in a creamy sauce. 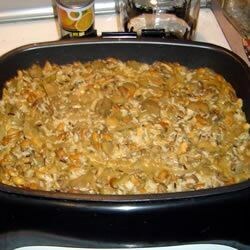 A rich and hearty side dish perfect with poultry, pork, or wild game." Heat butter and 1 tablespoon of olive oil in a large skillet. Add the eggplant, and fry until tender, about 5 minutes. Remove eggplant from the skillet, and keep warm. Add the remaining 2 tablespoons of olive oil to the skillet, and fry the onion and mushrooms until tender, about 5 minutes. Return the eggplant to the pan, and season with garlic, salt, pepper, and Italian seasoning. Cook and stir for one minute to blend the flavors. Stir in the chicken broth, and simmer for about 5 minutes, until most of the liquid is reduced or absorbed. Stir in cream of mushroom soup, half-and-half cream, and cooked wild rice. Simmer over low heat for 15 minutes, stirring occasionally. Taste and adjust seasoning with salt and pepper if desired. For each cup of wild rice, use 3 cups of water. Bring to a boil, cover, and simmer over low heat until tender, 45 to 50 minutes. This will yield 3 cups of cooked rice. I made this dairy free and it came out delicious! My son couldn't stop raving about it! Super simple to make. I served it over pasta. Definately a keeper!